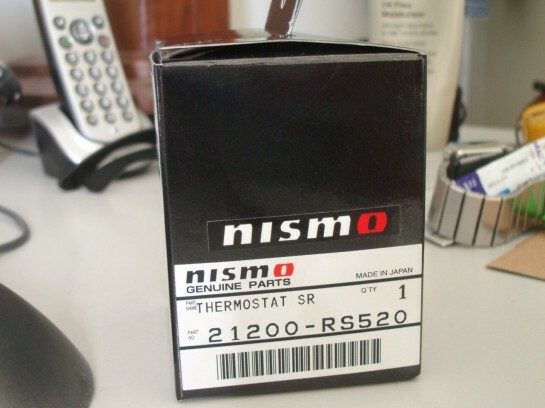 Before installing the Nismo thermostat, I popped it into some water and made sure that it was functioning correctly. The Nismo unit starts to open at 62.5C and is fully open by around 76C. Compared to a stock unit which starts to open at 76.5C and full opens at around 90C. After installation, started her up and monitored coolant temps. The temps increased at the same rate and reached 83C like usual and then the thermos kicked in to drop it back to 78C. There was pretty much no difference when idling! Now the improvements were found when the thermos kicked in, they stayed on for less duration to drop that 5C. My theory is that because the Nismo thermostat is opened fully at 78-83C that means more coolant is flowing, so the engine is being cooled down faster. With the stock thermostat, it's only partially open at 78-83C so won't cool as fast. So that myth about over cooling is busted... well not really. 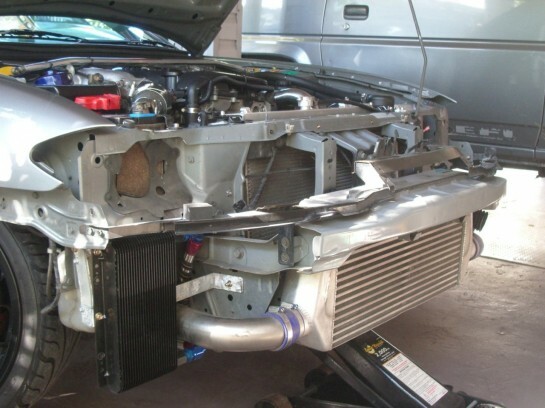 The reason my S15 didn't over cool was because I run thermos instead of a clutch fan. Because thermos are completely off during warm up, the engine temps are allowed to rise at the same rate. But in a car with a clutch fan, the clutch fan is never really "off" so it's constantly cooling down the radiator and it doesn't allow the engine to reach optimal temperature. As soon as the Nismo thermostat opens at 62.5C, cold coolant starts flowing and cooling down the engine. It's also important to know that when a clutch fan is "off" it's actually spinning at 25% capacity relative to the water pump RPM, and it reaches a maximum of 75%. I decided to try my luck and look at suppliers in the US. Damn they get everything for so much less over there, I paid around half of what Nissan Australia wanted for the pair! 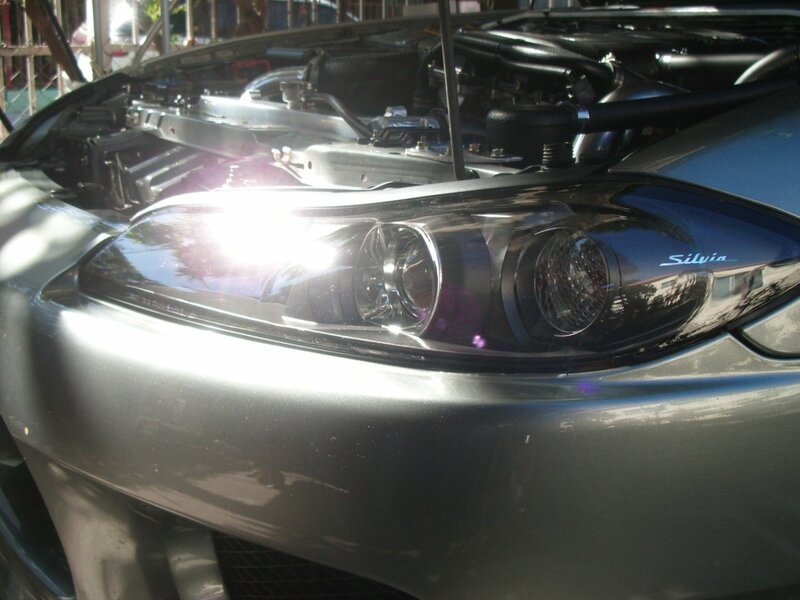 Strange thing is, the S15 was never sold in the US and it's not a legal grey import either because of the RHD issue. Anyway, a few weeks later they arrived at my door and I went about installing them. 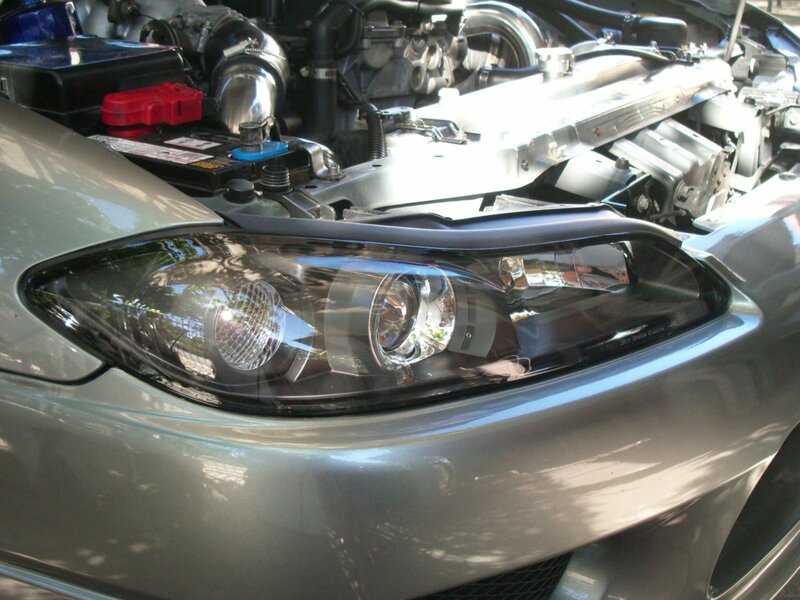 The ones I ordered are the JDM versions, very similar to the ADM except they have a different shaped parker light, and the rear house is black instead of clear. Front bar had to be removed, and old headlights out. New headlights in, and they look gorgeous! Wasn't a completely straight forward process like I thought it would be. Because I have my intercooler piping running through the battery tray, a small battery placed side ways had to be used. Because the battery being sideways, it was hitting against the headlight's rear cover. 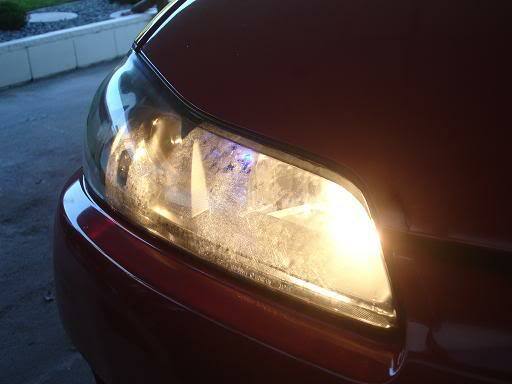 After looking at my old headlight, it was obvious the previous owner simply removed the cover and allowed the elements to get inside the headlight assembly. I decided to do it properly and cut out a circular piece out of some plastic. 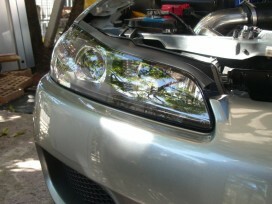 I then fixed it to the rear of the headlight with some silicone sealant. It's also very easy to remove if I ever need to replace a bulb. That's it for now, but there will be a large post in two weeks talking about the aerodynamics of cooling. Have a few awesome parts arriving too, so stay tuned!